BTCUSD returned near the 23.6% Fibonacci retracement level of the upleg from 3313 to 5440 around 4940 but failed to drop below it over the last few sessions. The price found strong resistance near the five-month high of 5440, slipping below the 20- and 40-simple moving averages (SMAs), however, the technical indicators suggest that bearish correction may came to an end. The stochastic is edging higher after the dive in oversold zone, while the RSI is flattening in the negative zone. In case of an upside run once again, immediate resistance would come from the 40- and then the 20-SMA currently at 5112 and 5155 respectively, ahead of the 5325 resistance, identified by the peaks on April 8. More gains could drive bitcoin to challenge 5440. On the flipside, if bitcoin retreats below the 23.6% Fibonacci, support would be faced near 4750, and then a touch of the 38.2% Fibonacci region of 4630 is possible. 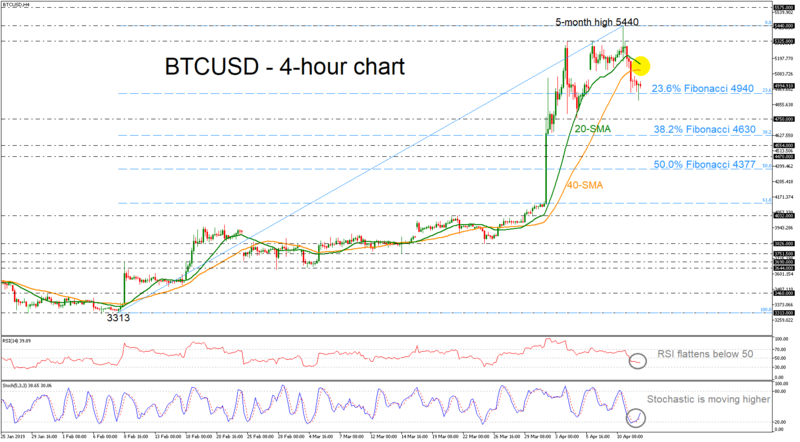 Overall, BTCUSD created a strong upward movement after a long time before slipping lower but indicators suggest a possible positive bias again.